The PKI 9820 is a new and state-of-the-art, up-armoured suit which already is in use at many government departments worldwide. 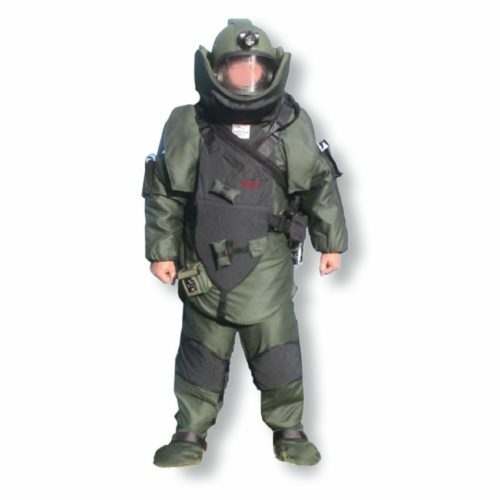 It provides the highest protection level of all bomb suits currently manufactured, whilst at the same time offering maximum comfort and flexibility to the operator. The ballistic levels and materials used in the various components of the PKI 9820 are tested and evaluated according to the full quality assurance standard laid down by the appropriate government organisations. All the ballistic inserts used in the PKI 9820 are made of waterproof treated KEVLAR-HT which are enclosed in a special water-resistant and anti-ultraviolet membrane. The outer cover is supplied in flame-retarding NOMEX III. In hot and humid countries the PKI 9820 can be supplied in conjunction with the PKI 9815 Body Cooling System. Helmet: GRP skin with elastomeric aramid core and inner lining (adjustable to various sizes), integrated microphone/earpiece with extension lead for connection to any radio transceiver, ambient sound facility, air cooling fan, helmet mounted torch with rechargeable batteries, antiballistic hardened acrylic/polycarbonate laminate visor, aluminium carrying case. Optional accessories helmet-mounted torch or video camera. For these 220 VAC or 12 VDC provides 90% recharge within 15 min.